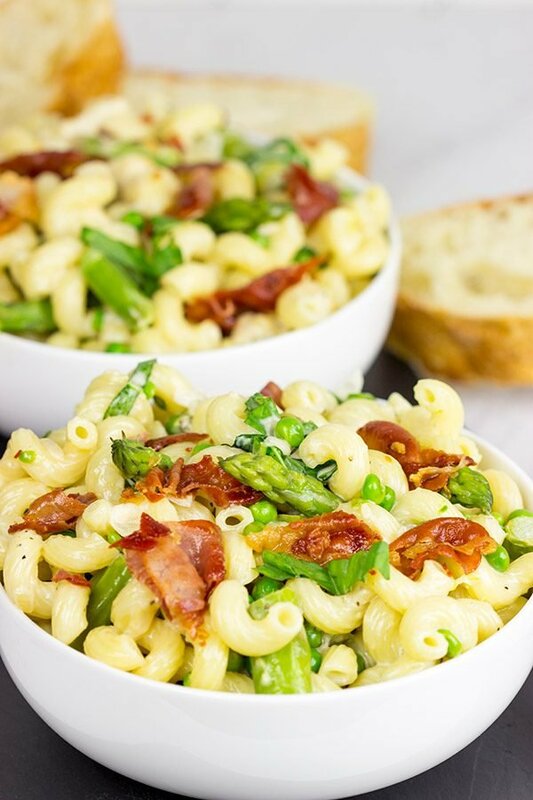 This Creamy Pasta Alfredo is served with asparagus and peas…and topped with crispy prosciutto! Oh, dear, dear Guiseppe. Our friend Pepi Roni was recently found murdered in the kitchen of his Italian restaurant in New York City. Pepi was such a kind-hearted man, and he had no enemies…or so we thought! In case you haven’t figured it out by his name alone, Pepi is not a real person. Nope, Pepi is the victim in a murder mystery dinner party that we hosted with our friends. Laura and I have playful personalities, and we actually own a couple of different murder mystery games. Sure, we have to play them with different groups of friends each time…but that’s totally fine by us. We don’t mind if we already know the killer. The games are still a great excuse to get together, eat good food and act like idiots detectives. 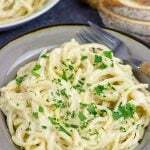 This Creamy Pasta Alfredo is a classic, and I chose to add in some asparagus and peas. Oh, and crispy prosciutto! We love Italian meats around our house, and prosciutto is one of our favorites. But this time I took a bit of that prosciutto and pan-fried it up into crispy bits. Then that crispy prosciutto went right on top of the pasta before I served it. Talk about delicious! Prosciutto is an Italian cured ham, and it’s usually served uncooked on appetizer platters. Prosciutto also goes well with honeydew melons, and that’s a fun + easy summer appetizer. Or figs. We’ve wrapped figs in prosciutto and then seared ’em in a hot pan. Delicious! But this time I cooked the prosciutto up until it was crispy. The result was something akin to bacon. Mmmm…bacon! Have you guys ever hosted a murder mystery party? They’re really fun, and not that expensive either. You’ve just got to make sure the people you invite will get into character. That and you’ve got to serve delicious food and good wine! 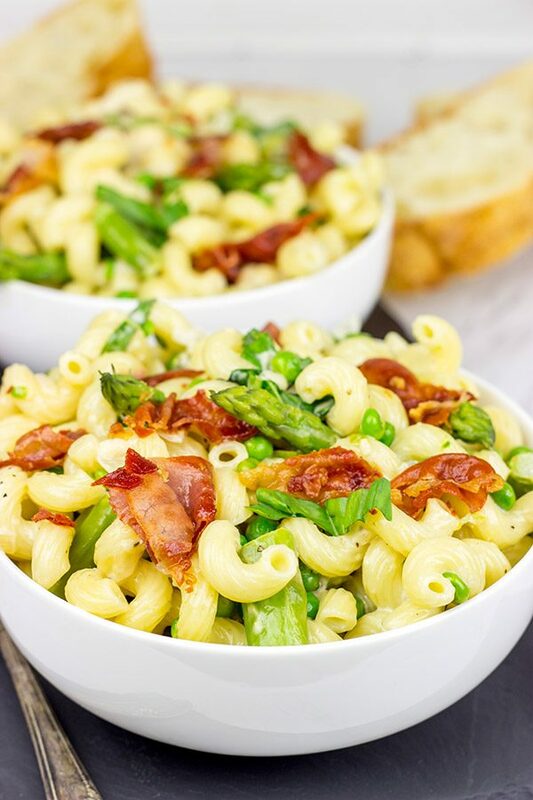 If you opt for an Italian-themed party, I suggest making this Creamy Pasta Alfredo with Asparagus and Crispy Prosciutto! Now, what sins would you like to confess to Father Al Fredo today? Using a large stockpot, add salted water and bring to a boil. Add pasta and cook for 5-6 minutes less than package instructions. 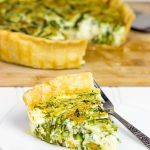 Add asparagus and continue cooking for 5-6 more minutes. Drain and set aside, reserving ½ cup of pasta water. Meanwhile, pour olive oil into large skillet and place over medium heat. Once hot, add prosciutto. Cook, stirring occasionally, for 4-5 minutes, or until crispy. Transfer to a paper towel-lined plate and pat dry; set aside. Add diced onion and garlic to skillet. Cook over medium heat, stirring occasionally, until onions just begin to soften (4-5 minutes). Add heavy cream, butter and lemon juice; let simmer for 4-5 minutes, or until butter has fully melted and mixture has thickened slightly. Add cooked pasta, asparagus, peas, Parmesan cheese and pepper; stir until well combined. Finally, add up to ½ cup reserved pasta water (as needed) and the chopped fresh basil. Toss until well combined. Top with crispy prisciutto before serving. I have never had a murder mystery party and never have never gone to one, but it sounds like a ton of fun. 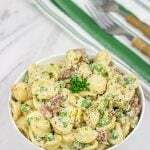 This creamy pasta dish sounds delicious. It would be great to serve at any party. This settles it, I’m moving in next door to you guys. I’ve always wanted to host one of those parties, ever since my parents hosted one when I was little; they did a potluck thing and I still remember their friend Cathy brought Oreo cheesecake. 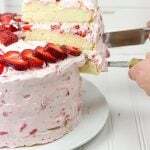 This pasta sounds equally as memorable as that cake :). I’d gladly chow down on a bowl while confessing all my sins (of which there are few and they’re mostly sugar-related). Hope Robbie had an awesome Halloween! Well that’s funny, Kelsie…because there’s a house down the street for sale. 🙂 But here’s the deal. If you move in, then you need to be prepared to come dressed as Mama Rosa (imagine an Italian grandmother who does all of the family cooking). Can you handle that? 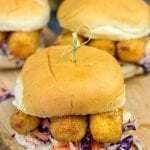 And then the next month, it might be Cayenne Remoulade, the shifty cook who may have committed a murder at Mardi Gras. Yes, we get a bit nuts around here…but it’s fun. Should I go ahead and put your invite in the mail? I love that you still remember what your parent’s friend brought to their murder mystery party. Hilarious! Thanks, Kelsie! Hi David! This is the kind of salad that I would any time of the day (or night)! If I have a pasta or potato salad in the frig I just keep going back for more. 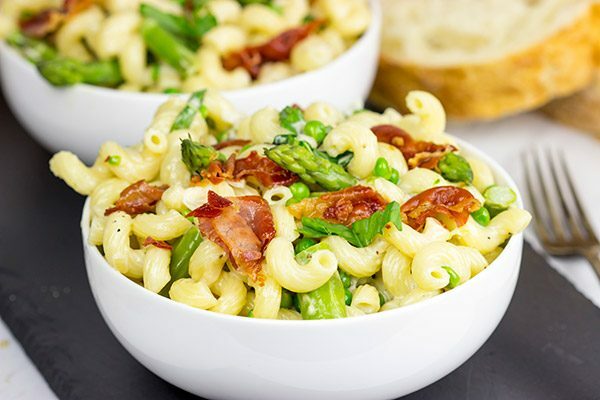 I always put peas in pasta salad, but never thought to add asparagus…good move! David, I’ve never heard of this game. I love mistery/criminal games, and we’ve had a few board ones, but this is a totally different concept. I need this! Wait, where am I going to find 6-8 players…hmm? I’m following Kelsie:) Anyway, when it comes to Italian food, and pasta particularly, I can always rely on you. You always have simple and earthy yet well-balanced and delicious combos. Well done here too! There is one confession I have to make to Father Al Fredo – I love crispy prosciutto! I’d probably try to steal it from everyone else’s plate when they are not looking. We could re-name the game to who stole the prosciutto … I have not played a murder mystery game since childhood but it was always so much fun. Great idea to host murder mystery evenings at home with some delicious food & wine! Have a nice weekend, David! Haha…well that’s not much of a confession, Miriam! I mean it’s crispy prosciutto. It’s in the bacon family, and we all know how good bacon is! 🙂 We seriously kept stealing pieces from the pan when I was garnishing this dish…to the point that I had to be careful that we didn’t eat it all first. Oops! Those murder mystery games are so much fun, and it’s all so easy when you use one of the kits. They’re a bit cheesy, but in a good way. Serve up several bottles of wine, and everyone will get right into character without a problem…even Father Al Fredo. You guys should host a party sometime this winter! It’s a great activity for a cold winter night. Yes!! We do indeed host murder mystery parties. I think part of it comes from a complete boredom that sets in on these cold, New York winter nights…but the parties are so much fun! And those kits make the whole thing so easy to host. 🙂 I think you should definitely try your cake hands at this one. It’s always good to have a tasty pasta recipe up your sleeve! Thanks, Deepika!! Oh I do love crispy delicious prosciutto in a pasta dish. It makes it all the more original and authentic don’t you think? And that’s definitely the case here David. Plus I love the addition of the asparagus and peas. And sins David? Truthfully, we just discovered crispy prosciutto not all that long ago…and woah! The flavor is so intense in the best way possible. 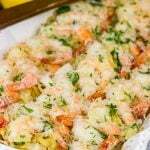 Just a little bit crumbled or chopped over a dish makes a huge difference! (That is, if you can avoid just eating it straight from the pan. Not like I speak from experience here or anything…haha!) Thanks so much, Neil! I’ll get some of this pasta heading your way soon! Love all the colours and flavours in this! 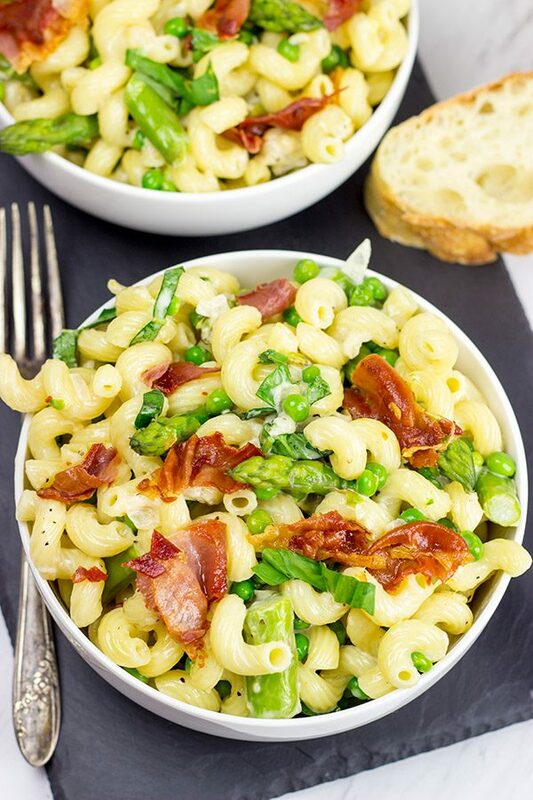 I haven’t met a pasta I didn’t like either and this creamy version with crispy prosciutto is definitely calling my name! If we were neighbours, I’d totally be game for playing that game (as long as there’s pasta involved, lol). Oh, you should totally grab a murder mystery game, Dawn. They are so much fun! You’ve just got to make sure you invite folks who will really get into character. 🙂 Also, this pasta is killer! (Get it? Killer? Like for the murder mystery? Haha!) Thanks so much, my friend! I love the recipe! Looking delicious! Funny game but forget it, I wanna have some pasta! As a passionate pasta lover, this dish is awesome, David! Excellent job! I am all about the pasta, too, Agness! And I’ve gotta say that this one is definitely up there on my list of favorites. 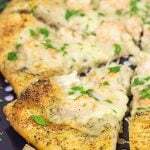 The creamy sauce combined with the crispy prosciutto is delicious! 🙂 Thanks so much, my friend! I totally want to hang out with you and your wife – you sound like so much fun! Especially if I get to eat things like this pasta!! Love love every flavor and texture in it! Haha! Well you are welcome to come on over whenever you’d like, Marissa! 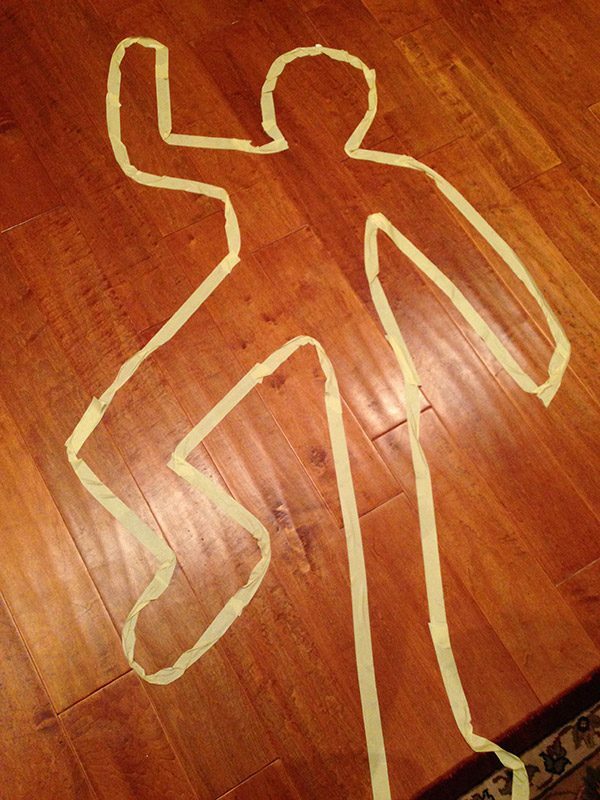 But be warned that you should probably come in costume…you know, for the murder mystery party! 🙂 This pasta really was quite delicious, and I’m already thinking about when I can make it again. Thanks so much for the comment, my friend! Hmmm…I’d probably have to confess that I was the one who ate ALL the fried up prosciutto that Father Al Fredo made, when he left the room to listen to all those confessions! 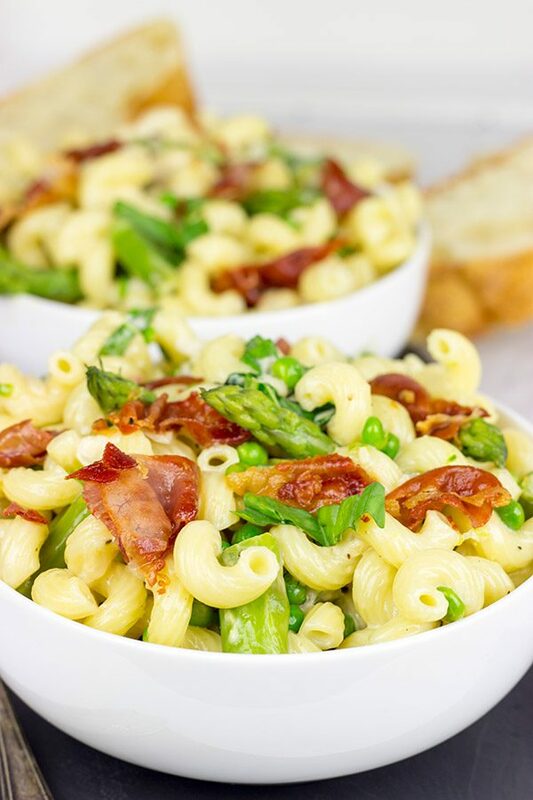 Dude – this alfredo with asparagus and crunchy prosciutto sounds fantastic! Btw – David, a murder mystery party is so much fun! Y’alls friends must have had a blast! I hosted one for Lil Shashi and a bunch of her high school friends and that was a blast – especially seeing that her friends came from different “cliques” and the murder mystery totally had them all talking to each other – even after it was all solved and over! So you’re the culprit! I did it…I solved the mystery! But were the one who also killed poor Pepi Roni? I bet it was you, you dirty scoundrel! Anyone who would steal all of the crispy prosciutto clearly has no conscience. 🙂 Murder mystery parties are so much fun, and just writing this post has made me want to host another one…perhaps once the craziness of the holidays is over. Thanks so much for the kind comment, my friend…or should I say, my suspected murderer?